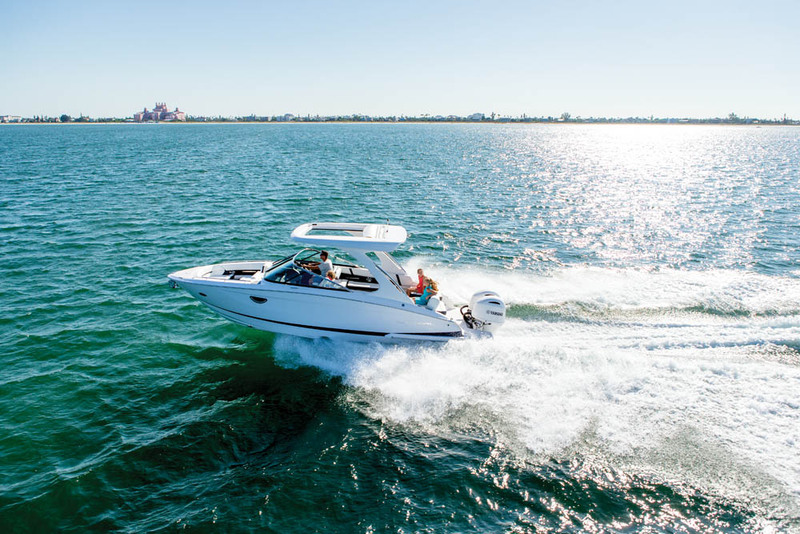 While Regal is primarily known for sterndrive boats in its sub-42-foot lineup, the 29 OBX Bowrider proves its designers can pivot with the best of them. Because this outboard-powered jumbo bowrider is based on the 2800, buyers get a giant bonus storage area where the sterndrive engines would have been. Outboard-powered boats typically don’t have as much lounging-at-the-stern space as their sterndrive counterparts, but Regal engineers created an innovation called Slide Away Seating, which electronically pushes the rear seating group forward 10 inches to create more room out back. When moved rearward, it increases the already impressive cockpit space created by its extra-wide nine-foot beam. Two large port and starboard benches provide plenty of seating. The bow section is really wide all the way forward and is extra deep, so if it turns into the kid zone, parents won’t have security worries. 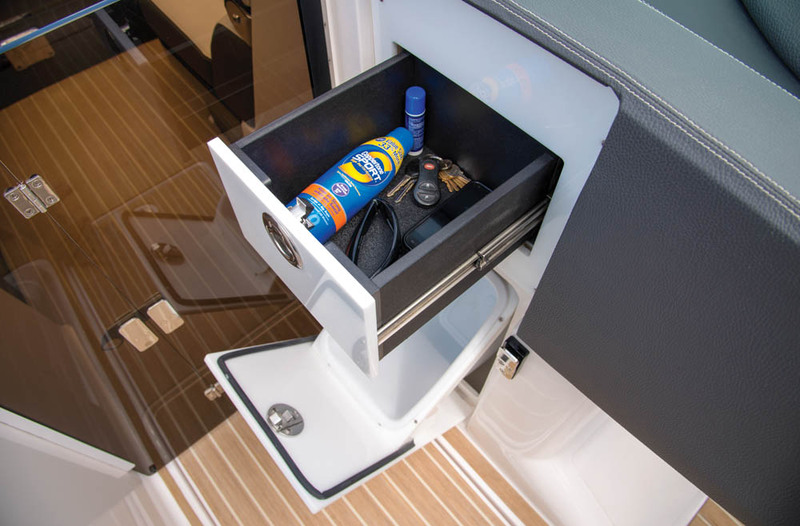 The head compartment is yacht-worthy and includes a standard chemical toilet, a glass vessel sink and cherry cabinetry. An optional hardtop ($15,135) features a huge sunroof and a retractable SureShade. Alternatively, the boat can be equipped for watersports, like our test boat, with an optional sports tower. Both the port and starboard crew seats are doublewide and have flippable seatbacks. At the helm, our boat had a hand-wrapped sportwheel, a double-stitched dash and a glass cockpit look with an optional Garmin 7610 Chartplotter ($3,750). 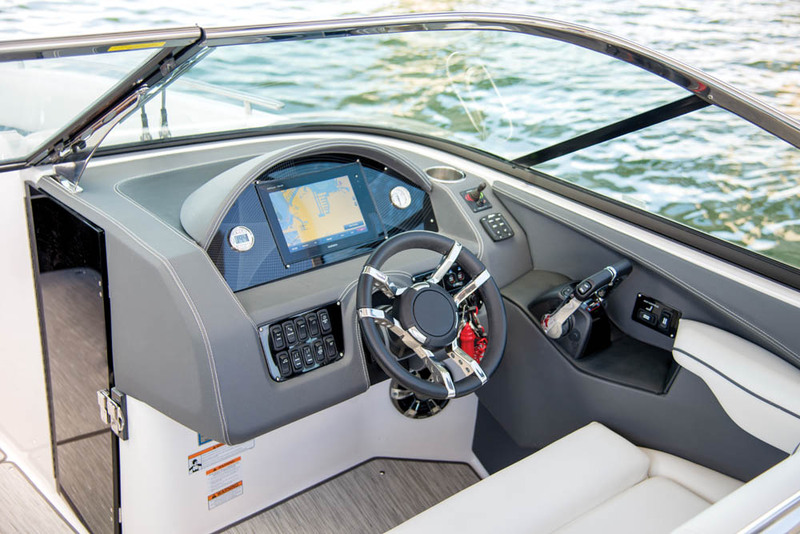 Our boat featured the Technology option ($5,755), which includes a power captain’s chair that is height-adjustable, an upgraded stereo, a battery charger and a lighting package that includes interior and underwater lighting. For easier docking, options include a bow thruster ($2,690) or joystick docking. 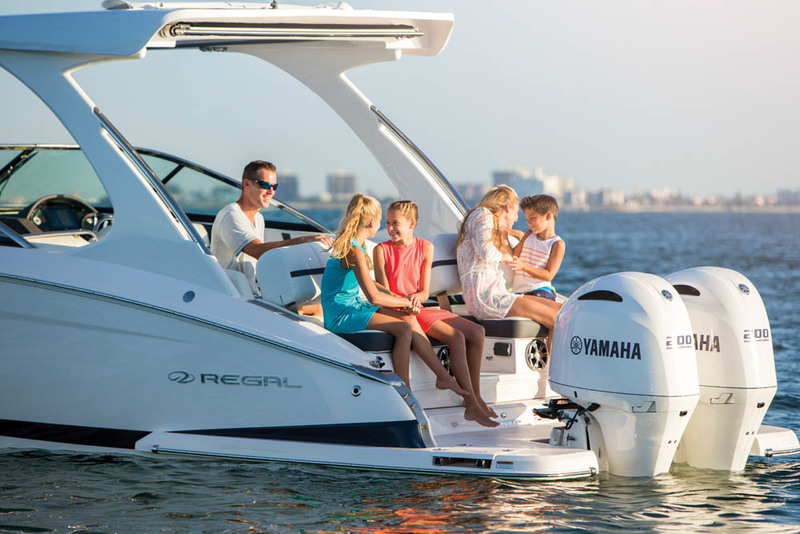 Thanks to the efficient FasTrac hull and twin Yamaha F250 four-strokes, the 29 OBX is a waterborne sports car. Its time to plane was a quick 3.8 seconds, and it ripped to 30 mph in 6.3 seconds. We tested this boat in really rough conditions in Biscayne Bay in Miami and were still able to achieve a top speed of 58.4 mph. The hull’s 19 degrees of deadrise ate up the chop in style and even cornered well despite the whitecaps. LOA: 29 ft., 1 in.